your choice of a printer is critical to your success. You should pinpoint the equipment that is capable of handling the type of work you require, is convenient and trouble-free, and incorporates seamlessly into your workspaces. Depending on your expectations, any of a number of printer types may fill your bill. If you need a full-service machine that includes a scanner, fax, copier, and printer, you are in the market for an all-in-one unit. This type of printer is a great workhorse for a busy office in which you produce printed materials, sign documents and scan them for emailing, plus receive and send information by fax. If you are not set up with a land-line phone however, you may not want a fax machine, selecting instead an all-in-one without a fax component. You will save a few dollars too. Before you scale back further, though, deciding that copying and scanning are features you donâ€™t need, remember that you may have unforeseen occasions when you are glad your printer can perform these functions. If you need a specific printer dedicated to a single purpose, such as photo printing, you should select your equipment accordingly. You can save on the purchase price of an all-in-one if you already have such a machine and only need a dedicated fax or an extra scanner. Another consideration when selecting a printer is the price of replacement ink cartridges for inkjet models or toner cartridges for laser printers. Sometimes a low-priced unit is not such a great buy if you must devote big bucks to purchasing refills. Also check whether the printer comes with full-sized cartridges or â€œstarterâ€ cartridges that will require you to purchase refills sooner. When you have narrowed down your choices, check the specs on the box for compatibility with your PCâ€™s operating system, especially if you use Windows XP or earlier Windows systems. Printer manufacturers gear their latest products toward the latest Windows version, so currently most of them are designed for Windows 7 and Vista compatibility. If a wireless printer is a must for your work environment, choose one that will serve all the PCs in your home or small business network via wireless modem. If you plan to use your printer at home while connected to your work PC via a remote desktop application, make sure that the printer you purchase works compatibly with the operating systems on your work and home PCs. You should look for other specs that may be important for your specific printer applications to ensure that the device is going to answer all your needs. One useful way to compare the numerous functions of your top three models is to compare them side by side on an office supply website that sells several kinds. Some of the printing functions that might make a difference in your use of a printer include automatic duplexingâ€“two-sided printing; enlargement or reduction of an original document; and the resolutionâ€“measured in dpi or dots-per-inchâ€“of both black and color documents that the printer can produce and fax. If you run large print jobs that you cannot always supervise, you should check the paper-tray capacity of the printer as well as the speed with which it processes, expressed in terms of pages per minute. 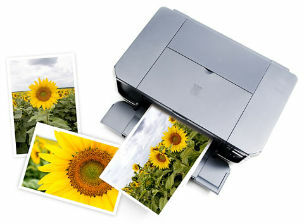 Be sure the printer is tough enough for your usage by checking the number of images per month it is designed to process. Also, if you plan to print more than just paper and envelopes, check to see if the printer accepts media such as banners, greeting cards, magnet sheets, or iron-on transfer sheets. Can the copier use legal-sized paper as well as letter-sized? Donâ€™t overlook some common-sense issues in making your printer selection. If you have limited space and need a machine with specific dimensions, be sure your the machine is sized appropriately. Double check what kind of connection the printer requiresâ€“USB, high-speed USB, Ethernet, etcâ€“to prevent nasty surprises when you try to set it up. If you are still dithering between models, consider the manufacturerâ€™s warranty and the price of the printer. All other factors being equal, choose the unit with the best warranty and the lowest price.